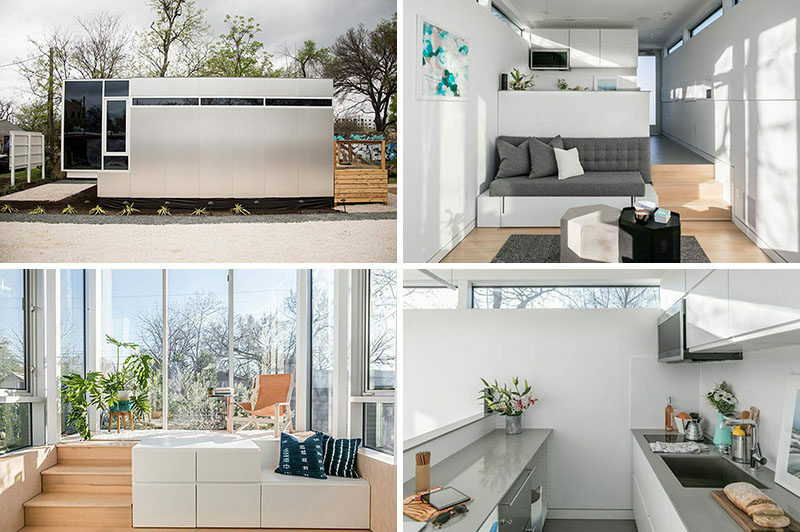 After living in a 33 square foot dumpster for a year to test the limits and see how much space someone actually needs to live, Jeff Wilson has created Kasita, a tiny house that measures in at just 352 square feet (32 square meters) and has everything you would find in a normal house. 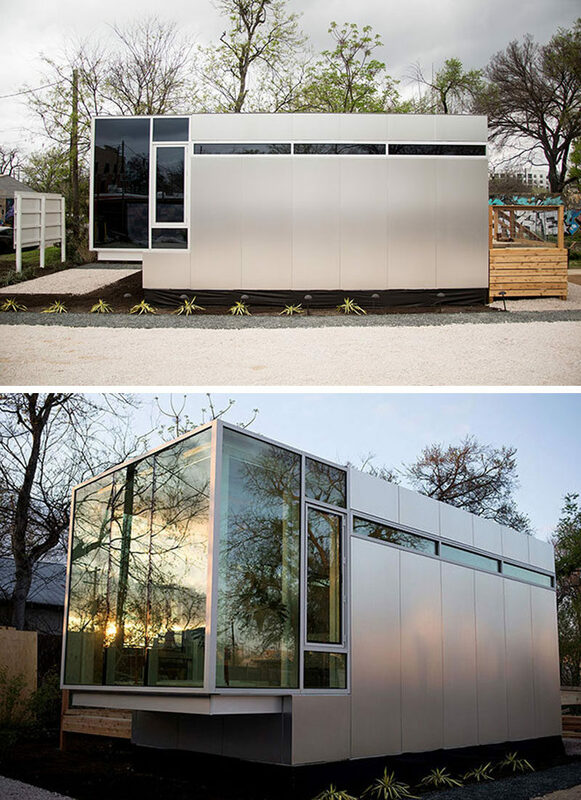 Kasita has been designed in a way so that it can be used for many different types of spaces, like a guest house, secondary income suite, office or a studio. Each unit has integrated technology that includes personal light and temperature settings, built-in speakers and a video-enabled doorbell. Before we have a look at the interior photos, here’s the floor plan that shows how the unit is laid out. 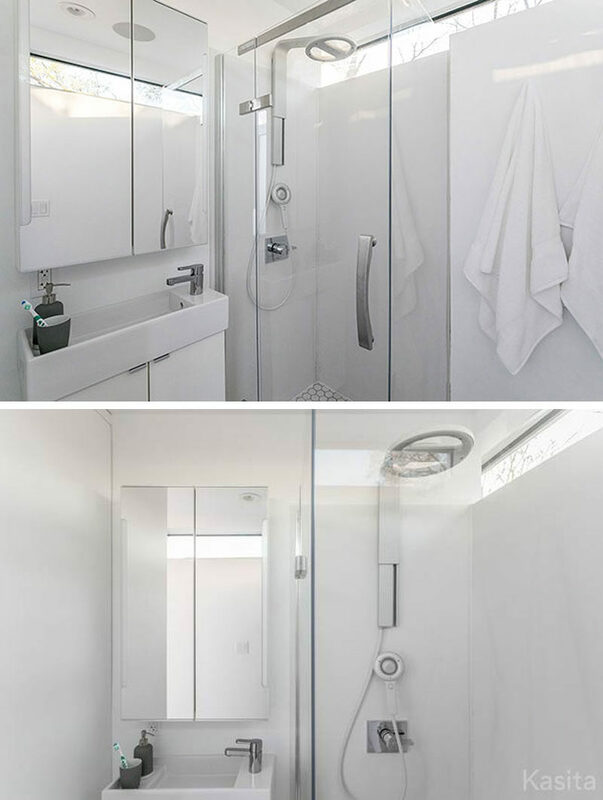 Entering the unit, there’s a small hallway, and off to the right of the hallway is the bathroom, fully equipped with a shower, toilet and vanity. 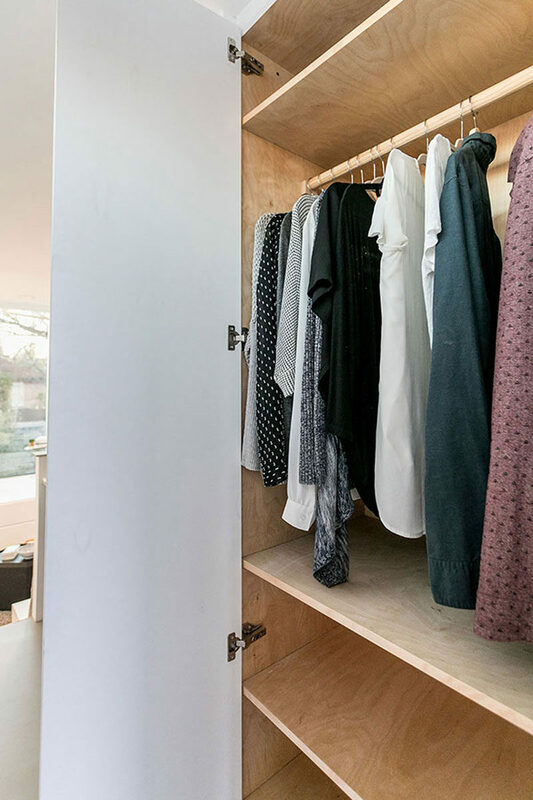 Just outside the bathroom is a storage closet with built-in shelves. The kitchen is located next to the closet, and it has a small induction cooktop and a convection microwave oven, as well as more storage and two counter spaces. 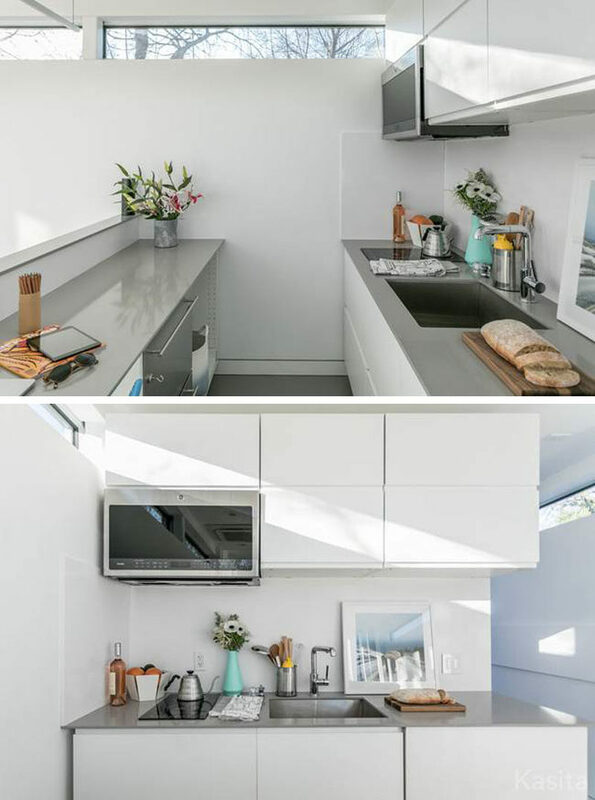 The second counter space doubles as a desk/small work area and below the counter are fridge and freezer drawers. 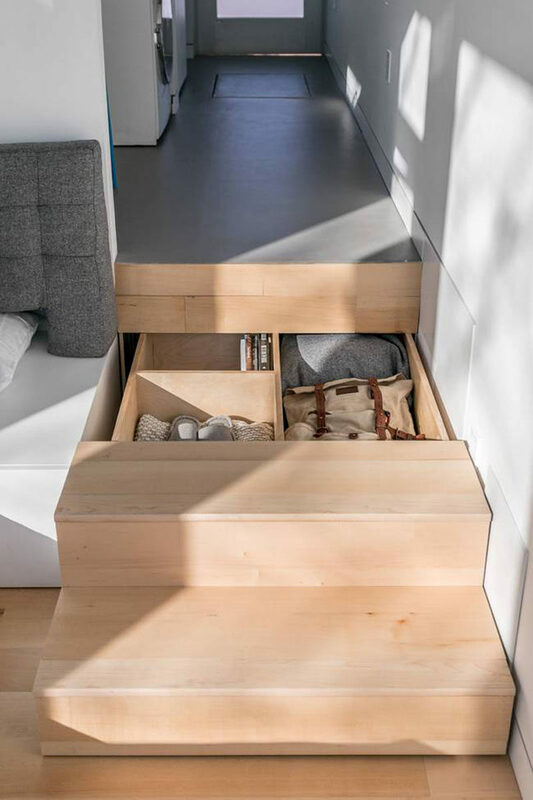 At the end of the kitchen counter, you can see the washer / dryer, and the wooden stairs that lead down to the living area have hidden pull-out storage drawers. Next up is the living room that has a ceiling height of just over 10 feet. A custom designed couch fits the space perfectly and hides a bed. The couch can be transformed into a queen-size bed by simply extending it out. Part of the couch frame now becomes bedside tables. At the end of the unit is a raised platform that’s surrounded by floor to ceiling windows, allowing plenty of light to fill the small space. 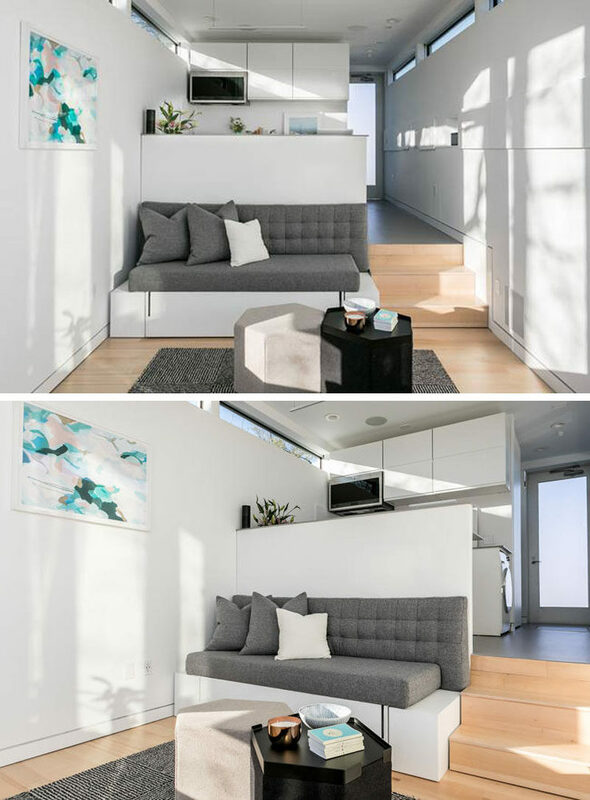 A flat-screen television is hidden within the white storage cube with drawers, that also has a small bench next to it.